As I boarded the Lufthansa flight to Frankfurt this past summer, the stewardess greeted me in German. It caught me by surprise, but I pretended to understand and nodded a greeting in reply. It happened again when it was time for the beverage service. "Was wollen Sie essen?" the stewardess asked me. This time I looked at her blankly, so she switched to English, asking "What would you like to eat?" It happened regularly throughout the trip: At the coffee stand in the Frankfurt airport; at a shop in Prague; at the hotel desk in Warsaw. When I was away from our Temple Israel group, and not wearing the name tag that identified me as an American tourist, people spoke to me in the local language. They switched to English when it became clear that I didn’t understand them. Then I realized: they think I am one of them. It made me uncomfortable, being mistaken for one of them. There was no logical reason for my discomfort. I'm sure they were perfectly nice people. But we were traveling in areas where atrocities had been committed. I was with a group from our Temple, a group that represented the Jewish victims of those atrocities. I did not want to be identified with those who had perpetrated those atrocities against my people. The assumption that I was German, or Czech, or Polish played on an old fear of mine: the fear that my blood relatives, some of whom live in Germany to this day, may have played a part in committing the atrocities of the Holocaust. I know it’s not rational to fear such a thing. I don't believe that blood is destiny. And I know that I don't have a capacity for murder, or an inclination to violence. I'm more afraid of my capacity to look the other way – to enable atrocities to happen. In this, I know I am not alone. Two experiences from our trip this past summer illustrate the human capacity to look the other way. The first was in Budapest. It was a beautiful morning and we stood at the banks of the Danube river, looking at a memorial composed of metal, sculpted, well-worn shoes: Shoes of men and women, boots and pumps, wingtips and sandals, all reflecting the fashion of the 1940’s; and sculpted shoes in children’s sizes, including a pair of those little booties that many of us wore as we were first learning to walk. There are three plaques written in Hungarian, Hebrew and English: "To the memory of the victims shot into the Danube by Arrow Cross militiamen in 1944-45." The Arrow Cross was a group of Hungarian fascists who continued killing Jews after the Nazis withdrew from Budapest. These Arrow Cross thugs would bring people to the river bank, make them remove their shoes, and then shoot them so that their bodies fell into the Danube. On the morning we visited the memorial, I stood and watched the slow current of the river, and then looked up at the rolling green hills across the Danube. Such a beautiful view, I thought. It was the very last that victims would see before darkness fell. Then I turned to look in the other direction, away from the river. There I saw old apartment buildings across a narrow street, just a few feet away from where I stood. There must have been neighbors who witnessed these murders. How could they not have seen, or heard, what was happening? Did they watch with silent approval, or turn away with indifference? Then our guide showed us another area, the site where the gallows stood. Just down the road stood the house where Rudolf Hoess, commander of the camp, lived with his family. Rudolf Hoess wrote in his diary that he was proud to run “the greatest human destruction machine of all time.” And just yards away from the “greatest human destruction machine of all time,” the chief operator of this machine raised his children. His daughter Brigitte was six years old when she moved to the house at Auschwitz. In an interview last year, Brigitte said she enjoyed a “beautiful childhood” behind the garden wall of the house. The family had staff to wait upon them and work in their garden, “staff” who wore striped prisoners’ uniforms. Furniture and artwork stolen from victims of the Nazis decorated their home. And from the upstairs window the children could see prisoner blocks and the old crematorium. Recalling her childhood in Auschwitz, Brigitte later said “I never asked why there were fences and watchtowers. When you are nine and ten years old, your mind is filled with other thoughts.” Only as an adult did Brigitte struggle to come to terms with the fact that she was an unintentional bystander to the mass murder perpetrated by a man she knew only as a warm and loving father. In the interview I watched, it was clear that even after all these years, she still could not quite believe that her father was guilty of the atrocities he committed. But we don’t come here tonight to stand in judgement of others. We are here to judge ourselves. Rabbinic tradition teaches us that Yom Kippur is a day of judgment, and nobody gets a pass. There are no thoroughly righteous among us; nor are there people who are thoroughly wicked. Most of us are somewhere in between. During these days we are to view ourselves as equally weighted between righteous and wicked. Here is the point of Yom Kippur: To be honest with ourselves; to confront the darkness that dwells within us. If we are here tonight only because of the beautiful cello playing, or the majesty of the music, or out of mere habit – then we are missing the point. I returned from Eastern Europe firmly convinced that there is a capacity for evil within each of us, and that we have to guard against it. These days our worst impulses can be triggered just by watching the news. When I hear of another terrorist attack or another incident of gun violence, or see photos of more children killed in Syria, or learn that one more black man has been gunned down, or read about the melting ice caps and rising oceans -- I am afraid, I am angry, I feel helpless. I don’t like to feel that way, so I am tempted to tune out. And if I tune out, I become a bystander to the crimes that are perpetrated even today. I don’t think I’m alone in feeling this way. So what are we to do? A final story about a place we visited in Eastern Europe this summer: It was a room tucked into the wall of a courtyard, a room that held a secret for fifty years. Sunlight did not penetrate its gloom; it was likely a storage place for potatoes or other perishables. For five decades the Hebrew letters painted on the walls remained undiscovered in the silent darkness. Twenty years ago, the family who owned the storage room discovered the Hebrew letters during a renovation project. Their town of Terezin in the Czech Republic had become home to museums documenting the operations of the concentration camp established there by the Nazis: Theresienstadt. The Hidden Synagogue: How appropriate that a synagogue should have to be hidden from the Nazis. For those who believe that organized religion is the cause of so much evil in this world, the Hidden Synagogue offers a stark rebuke. This is the truth: at its best, our religious tradition is meant to subvert everything that a murderous regime embraces. Outside of these walls there are many who glorify brutality; in here, we promote decency and kindness. Outside of these walls, there are many who condone injustice; in here, we stand up for what is right. Outside of these walls there are those who act like beasts; in here, we strive to embody what it means to be fully human: vessels of the divine spark that dwells within each of us. Tonight we acknowledge that we are equally balanced between righteous and wicked. 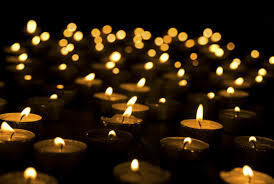 Tonight we acknowledge that all too easily, we can become silent bystanders to the atrocities of our world. Tonight we affirm that if we are to nurture the best impulses of our heart, we cannot listen to the thunderous voice of a dictator – we must listen to the still, small voice that urges us to all that is right and good. This is the voice we are meant to hear when we come together within these walls on this sacred day. May we open our hearts and listen.